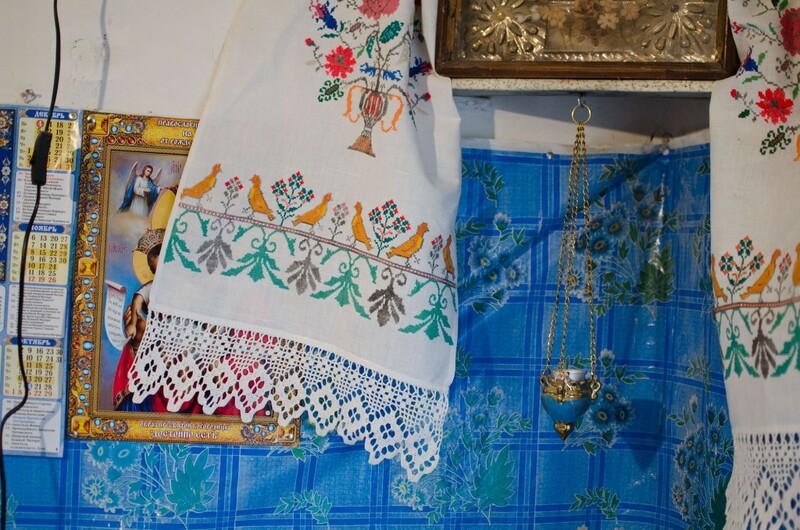 The Babushkas have large collections of embroidery and some are displayed proudly around the religious icons in their homes, however they have not done any embroidery in years; ‘I am too old’, ‘it’s just something you do when you are young’ – to prepare for marriage, a husband, a home – a bottom drawer, ‘I don’t have time’ – when children came along and they were working on the Russian collective farms, for a wage of produce, it was hard work from dawn to dusk, and the same now they need to be completely self sufficient. Other reasons are poor eyesight (often from the effects of radiation) and/or rheumatism and arthritis, that is often the result of years of hard manual labour. I wanted to give the Babushkas an opportunity to do embroidery again, gaining some moments of enjoyment, some company, (many don’t see anyone for weeks on end) and, to show my interest in an aspect of their lives that is unrelated to the nuclear accident (by which they should not be defined). And…also to show that they had support from people in other countries, unbeknown to them, and to bring them some comfort in knowing they were not completely alone in spirit. 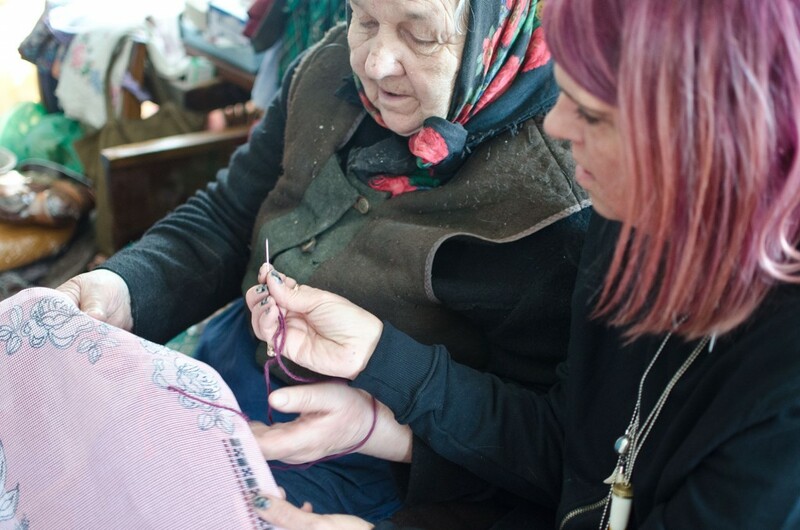 Each Babushka would execute some stitching, and then the next Babushka and so on, producing, in effect a communal piece, bringing them all together as a community through their shared interest and experience. They said they loved the idea and asked about all the other Babushkas involved. That we do not speak the same language was somewhat irrelevant; a touch on an arm, or a minor act of physical affection goes such a long way. [I remember giving a manicure to a refugee from Iran at a drop-in centre and upon becoming emotional she explained that this was the first time anyone had touched her in a whole year]. There were many things to consider when thinking about the embroidery we would do together and after researching traditional Russian and Ukrainian embroidery and scarf design (as during previous research and when interviewing the Babushkas some months ago, they told me that they used to copy the imagery from their scarves). I drew and developed motifs, stylising them further so that there was an element of authenticity but above all an ‘easy’ pattern to follow – larger shapes that would not lose definition on a large scale. Choosing tent stitch and a tapestry wool for quicker coverage of area and using needles with the biggest eyes I could find, on a stiff canvas that would be easier to hold seemed to be the best way forward. 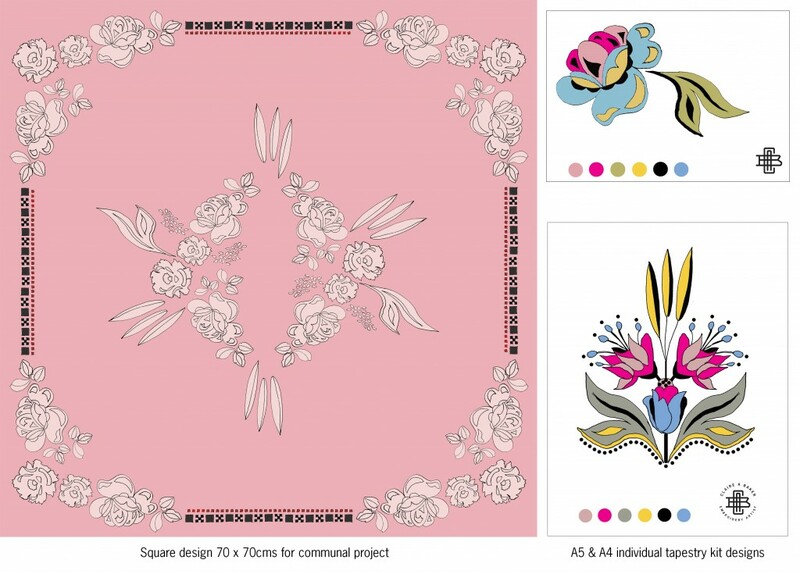 I designed a larger piece for us to work on using simple florals with some geometric elements on a pink ground in a square format reminiscent of a traditional peasant headscarf, large enough to be worked on around a table or by 2 of us sat side by side. Not too large to be cumbersome or over-aspirational. The ground was coloured so it would not be necessary to stitch the whole piece. In addition and so the Babushkas could continue after the workshop, I produced small tapestry kits of a single motif. 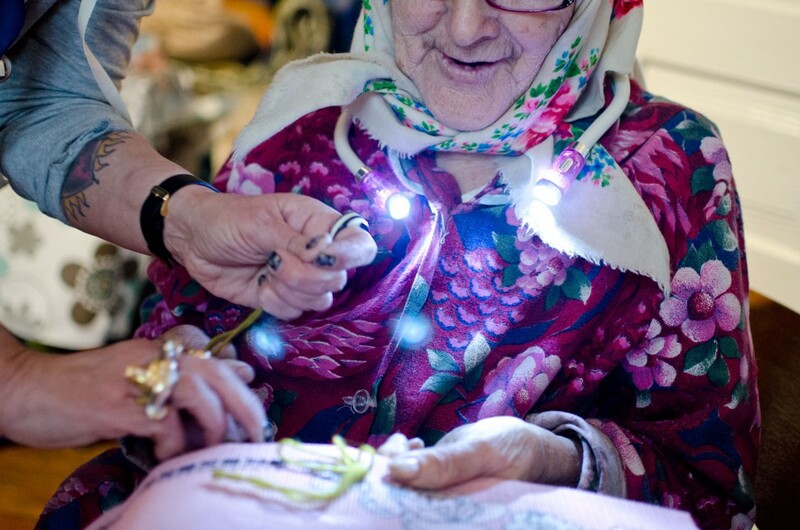 The Babushkas were over the moon to have such a gift – they held the wools to their bosoms, seized on the small scissors with delight and were so excited by the needles, reading glasses and neck lights. It gave me such pleasure. I would again like to thank all the people who donated threads, they were SO appreciated! It was a necessity that I worked with each on an individual basis purely because of their isolation and that they are often living alone in abandoned villages or not within walking distance of others, even if they were able to. The snow was still on the ground and where it had started to melt had left huge muddy puddles and marshy ground. Each Babushka was nervous, saying they could not do it anymore, but they really tried. I sat with each one, threading the first needle, and tying the first knot then encouraging them to choose a colour and starting point by smiling and pointing. Then the magic happened. Head down, staring intently at the fabric, rolling the needle between finger and thumb they started to stitch, slowly at first and very carefully but their eyes shining and their lips smiling, it made them so happy. They could only manage a few minutes, one leaf or one row but the concentration in their faces submersed in that moment and their own memories was so priceless and captivating to a degree that I never expected. Observing the Babushkas in their home surroundings and interacting with them was a very personal and fulfilling experience. And it meant they were comfortable and in control of the proceedings. All were very welcoming. Due to the lack of a common language, expression and body language actions were heightened and easy to read. It became a more physical experience. The activity gave an excuse to be closer to them and did nurture and cement a relationship, it was only the women I had already met that wished to participate whereas the two women who I had never met, although they happily showed me their previous work and talked about it to me, did not wish to do any stitching. Their reasons were understandable – Hanna was in the middle of painting a wall, preparing for the Easter weekend so her home was naturally in a state of disarray when we arrived. Maria had poor hearing, eyesight and lacked dexterity in her hands. The whole experience was intense and emotional, certainly where I was building upon past meetings and visits but this project is merely the start of something and, due to the relationship nature of it, must continue over the next years. 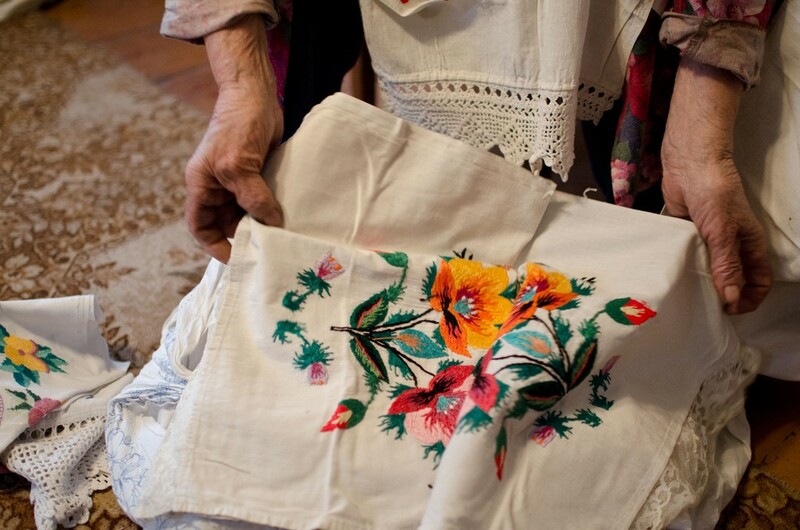 I will carry the communal cloth with me, adding more stitches on each visit, the piece to be completed in tiny, bite sized chunks which is much more manageable for these Babushkas and will further cement an on-going relationship. There is a sense of urgency, which is underpinned by the anxiety of how I can fund more visits. 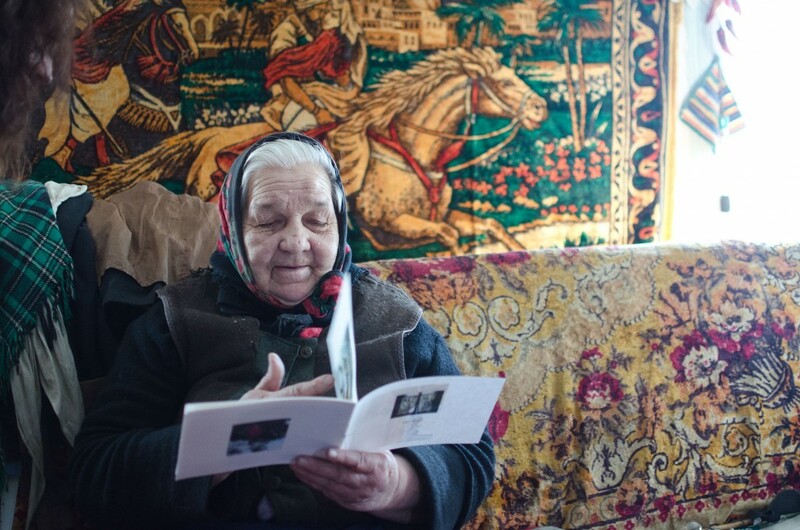 There is, pushed to the back of my mind the frailty and sense of running time where the Babushkas are getting older, which is their fear too, and that for the future of their land. Maria is 90, and the average age of the women I worked with was 78 years. Embroidery, stitch and textiles are a common thread and language the world over. 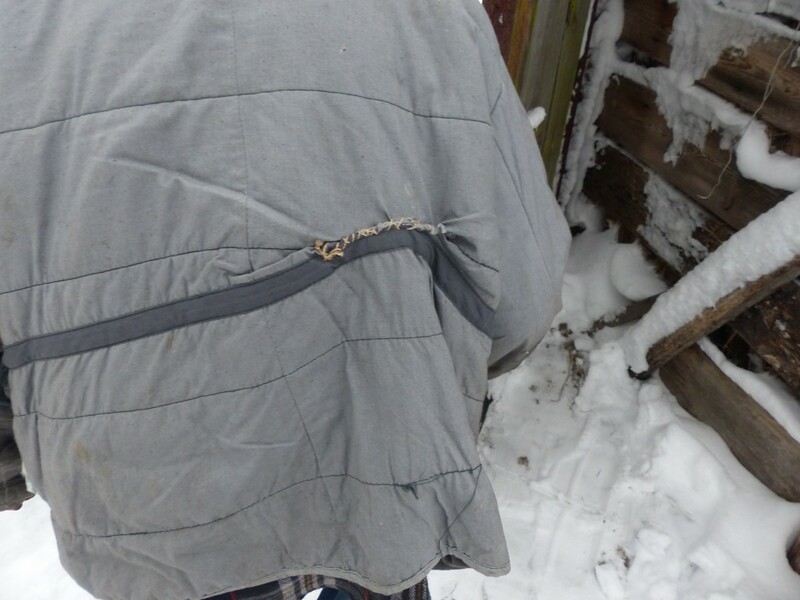 This is Ivan who stitched a tear in his overcoat, and who has a high appreciation of his late wife’s embroidery work.